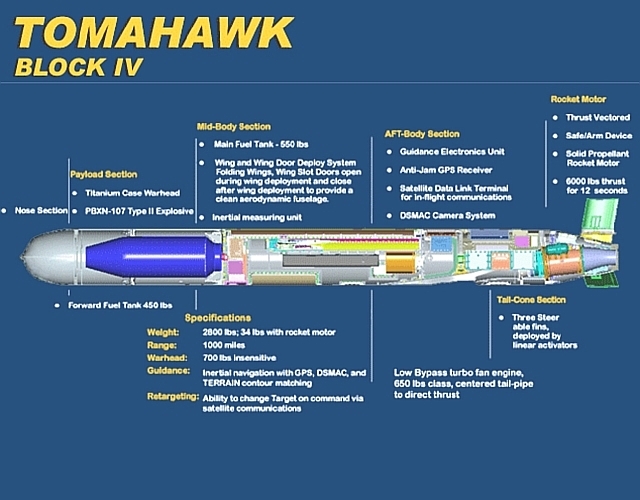 The General Dynamics Tomahawk family of cruise missiles is a pivotal type in the development of modern cruise missiles. 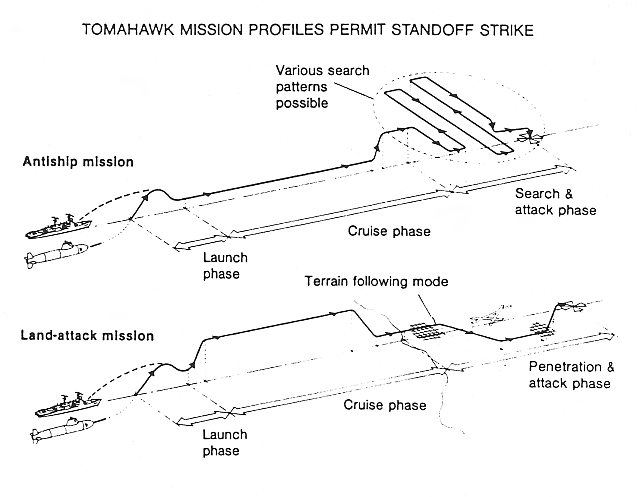 The baseline Tomahawk spawned a large number of subtypes or variants during the 1980s, followed by ongoing evolution of the most widely used TLAM-C/D variant, culminating in the largely new low cost 'Tactical Tomahawk' design of the current era. 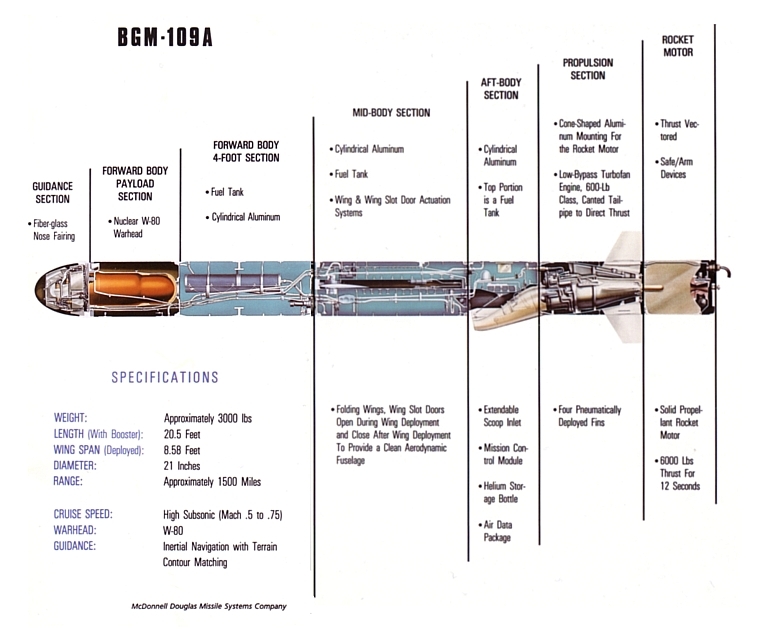 Moreover, the Soviet Raduga Kh-55/RKV-500 Granat or 'Tomahawk-ski' was patterned after the BGM-109 series, spawning submarine, ship, air and ground launched variants. 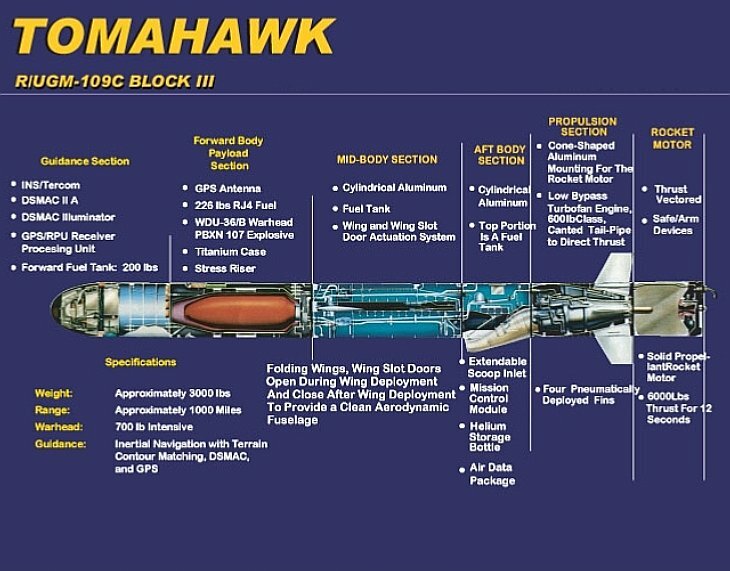 Despite its unique engine arrangement and later evolution, the Granat follows the Tomahawk model closely. 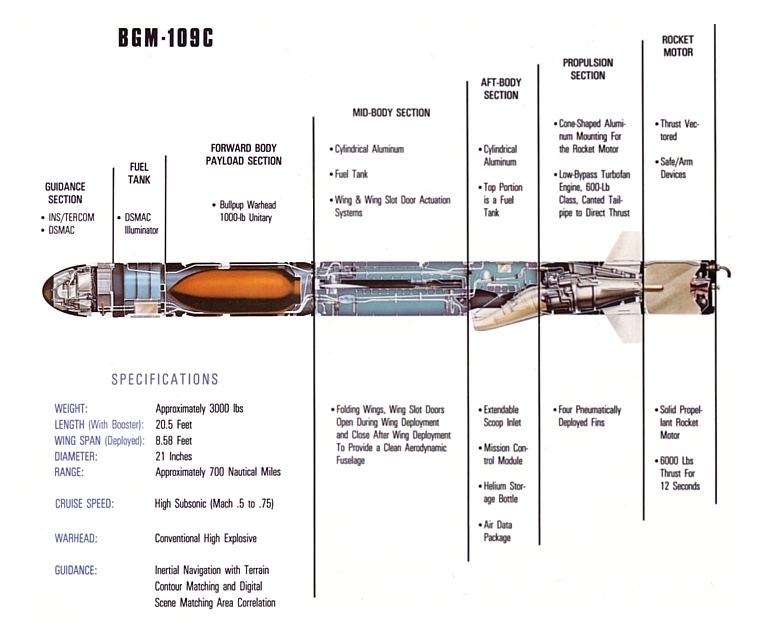 More recent Russian weapons such as the new Novator 3M-54E1 and 3M-14E Club S/N cruise missiles, while again unique, follow the pattern of the Tomahawk. 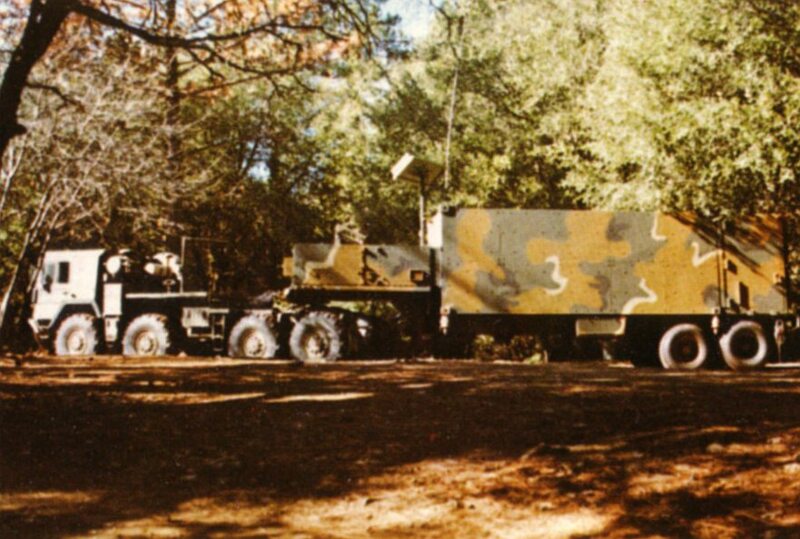 What we know of the PLA's emerging indigenous cruise missile designs indicates a similar evolution. 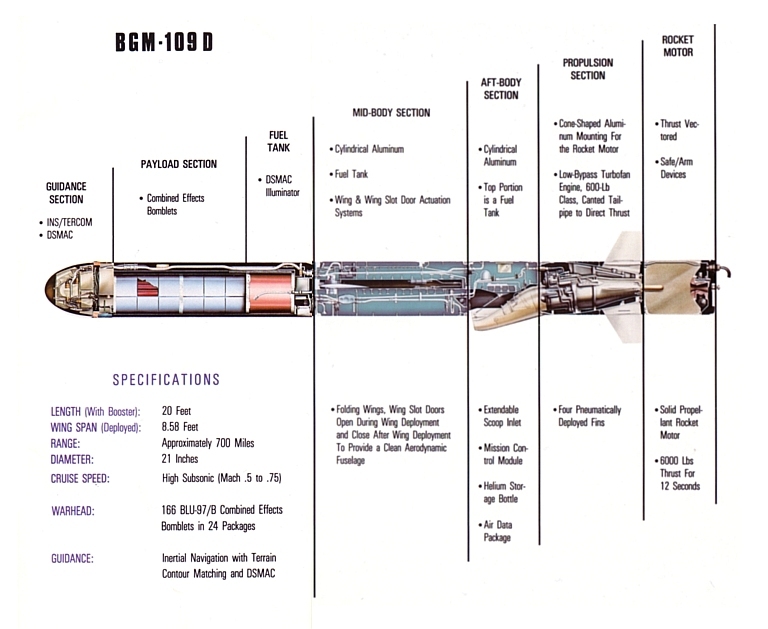 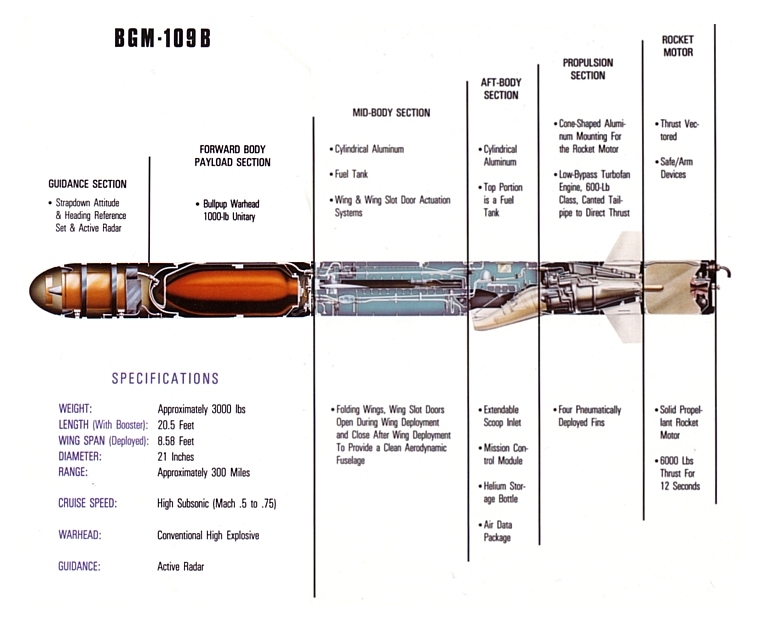 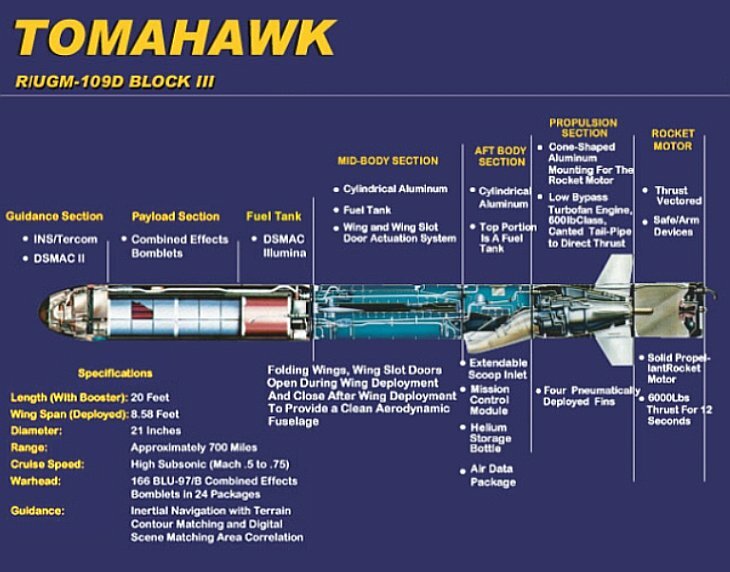 This webpage will provide some insight into the early evolution of the Tomahawk family of missiles, using materials provided to the author during the 1980s by General Dynamics and McDonnell-Douglas, who manufactured the missile during that period. 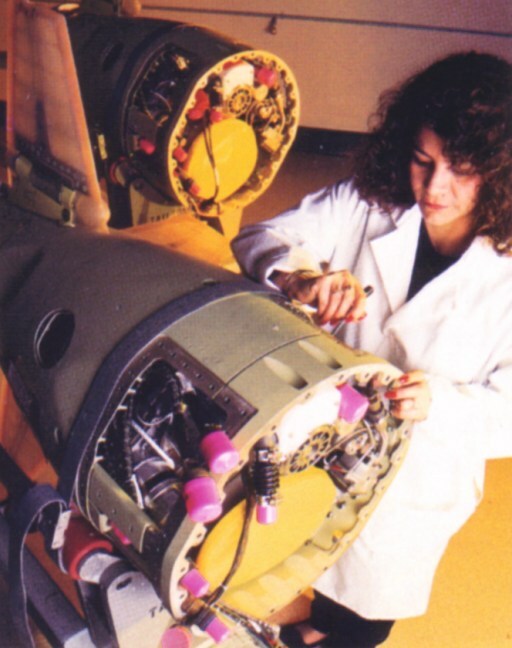 With the collapse of the Soviet Voenno-Morskii Flot as a key global player after 1991, much of the TASM warstock was rebuilt into TLAM-Cs and used to bombard land targets instead. 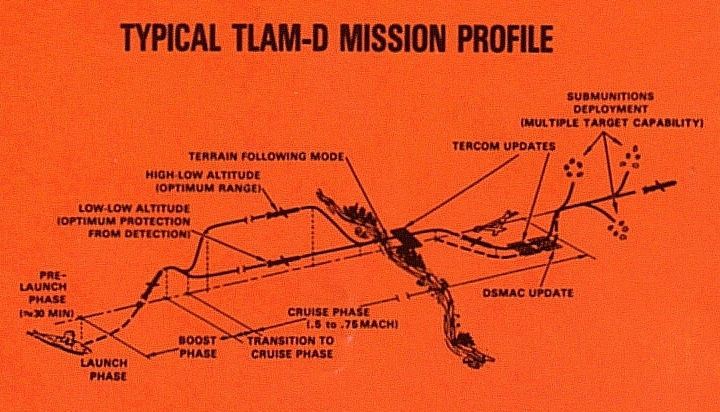 The TLAM-C was by far the most widely used of the early Tomahawk variants, and played a major role in the Desert Storm campaign of 1991. 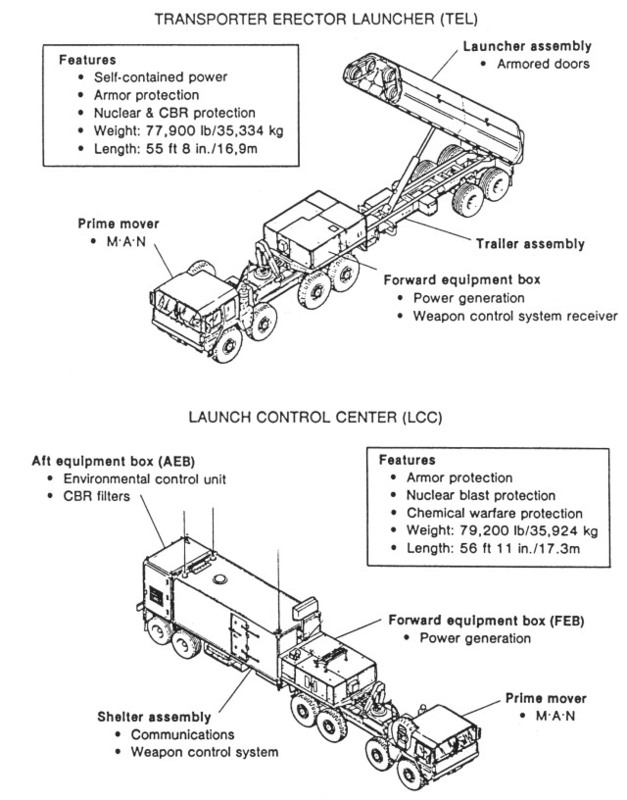 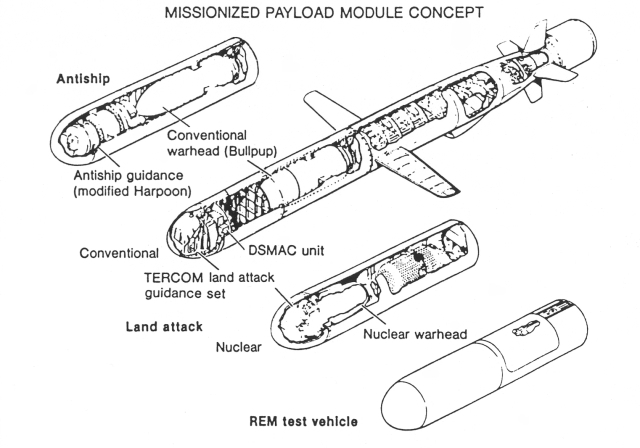 The submunition dispensing TLAM-D was used in Desert Storm, and subsequently, for niche roles where the submunition payloads were more useful than the unitary warhead. 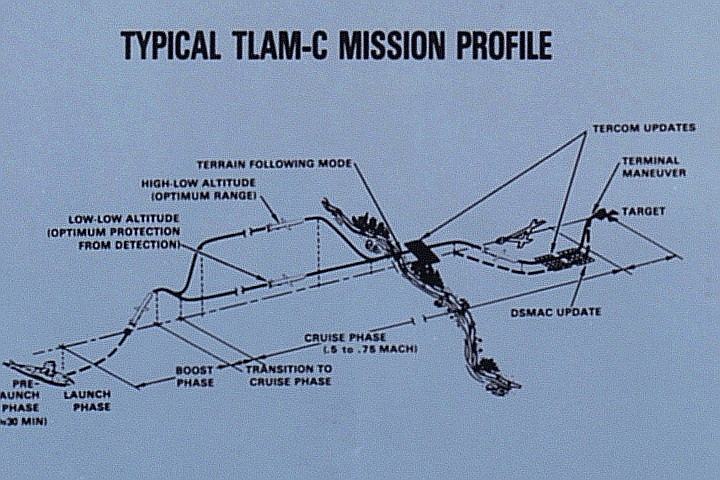 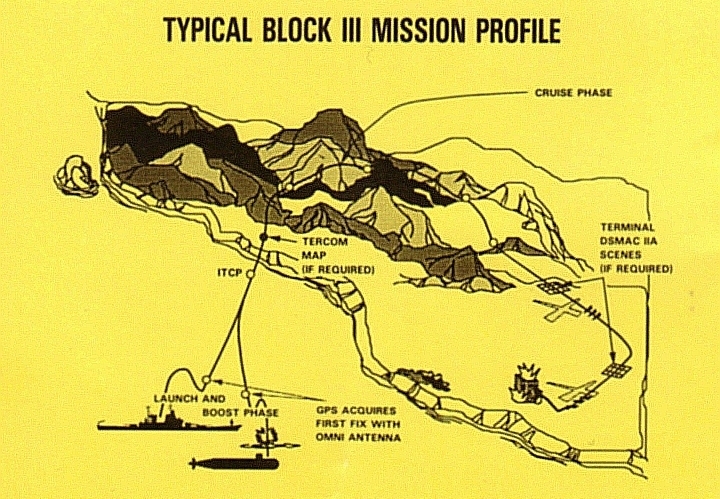 The Block III TLAM-C was a major improvement over the baseline TLAM-C, incorporating GPS to provide additional inputs to the Kalman filter in the navigation system. 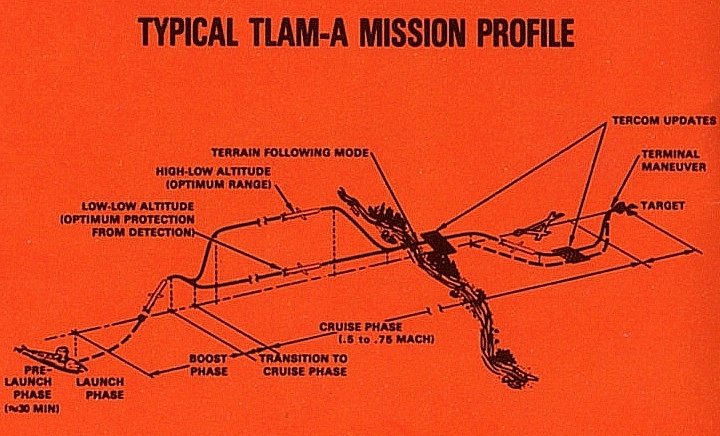 This resolved issues arising from poor TERCOM fixes in flat or poorly featured terrain, characteristic of major Middle Eastern and littoral environments. 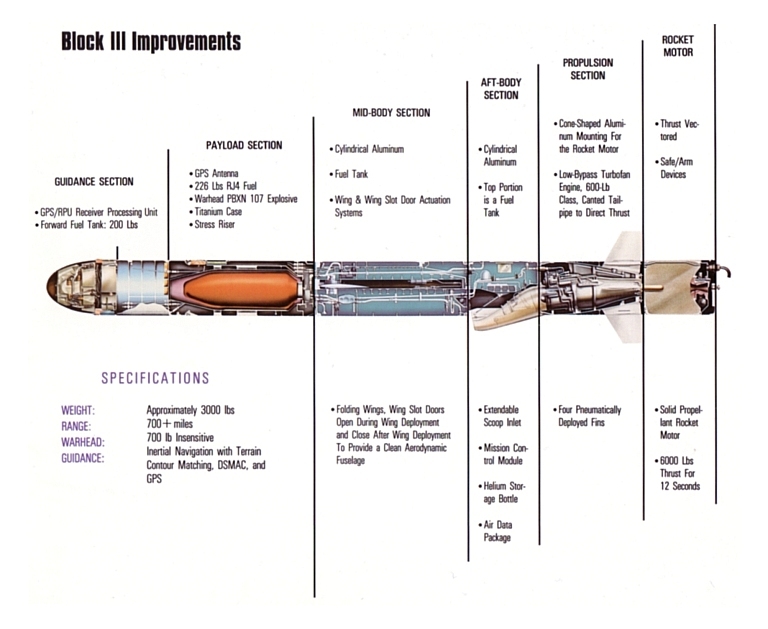 The GLCM was without doubt the most strategically important of the early Tomahawk variants. 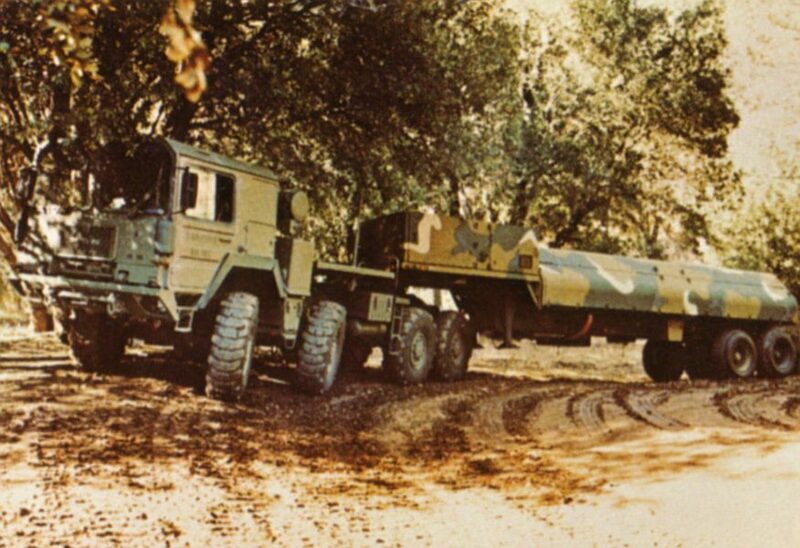 Deployed in Europe to balance the Soviet SS-20 force, the GLCM drove the Soviets to the negotiating table. 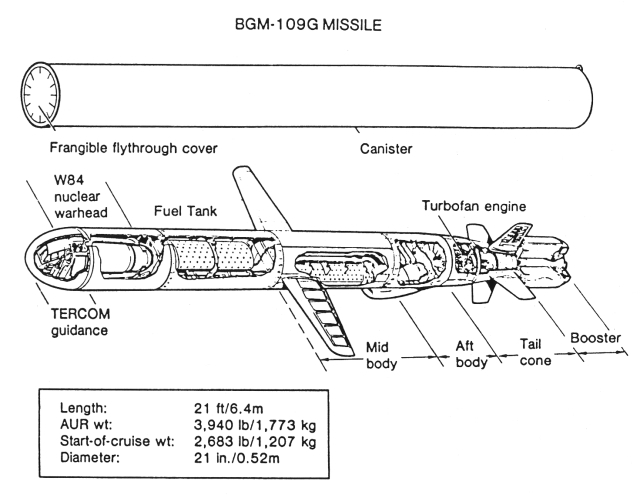 The GLCM stock was subsequently destroyed in compliance with the resulting treaty. 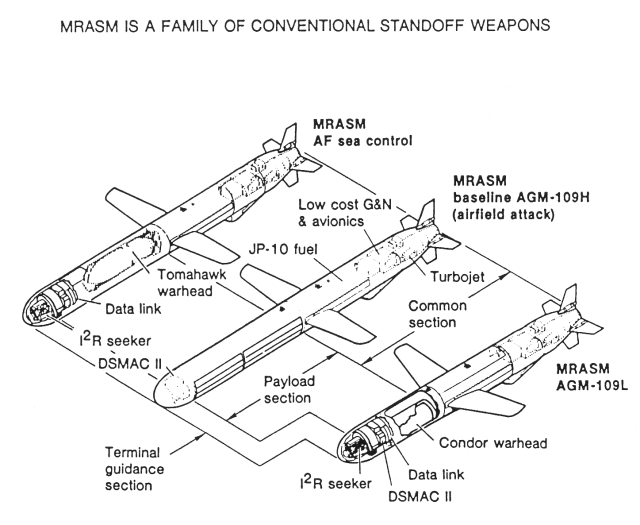 The MRASMs were direct derivatives of the Tomahawk, designed to provide a tactical cruise missile for delivery by the US Air Force B-52G and F-16C, and the Navy A-6E Intruder. 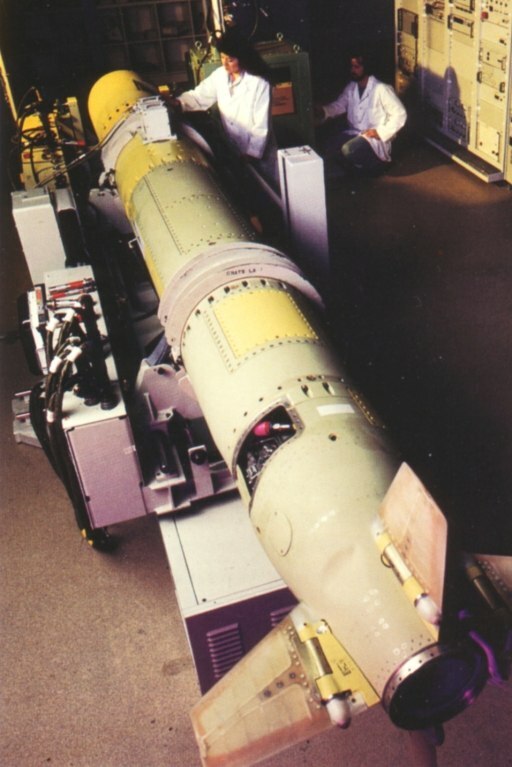 The MRASM used a turbojet reducing range and cost, but retained much of the core guidance system of the early TLAM-C/D, with additional enhancements. 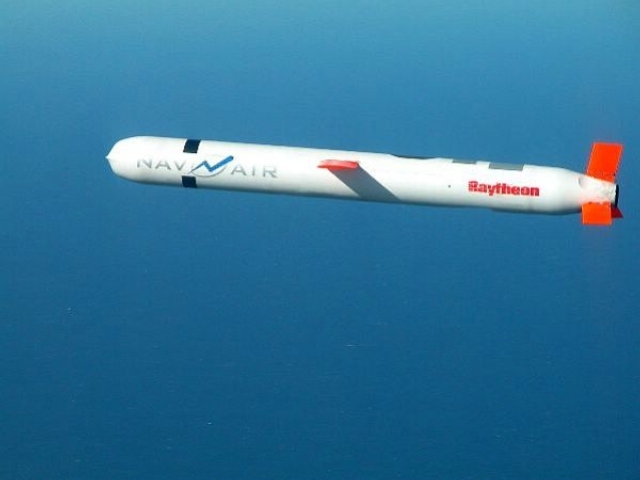 The MRASM was cancelled in favour of the AGM-137A TSSAM, which was also cancelled, in favour of the AGM-158 JASSM, now entering production. 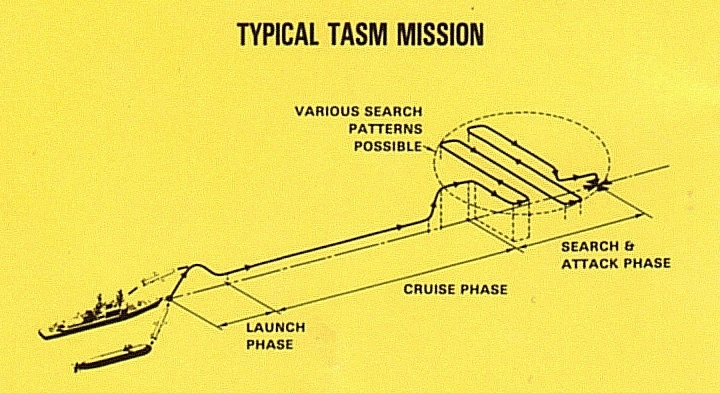 While the MRASM died quietly during the 1980s, its successors such as the SLAM-ER, TSSAM and JASSM all adopted the same model of combining cruise missile guidance, turbojet propulsion and terminal seekers.